Brief Description: Yellowed grass with “smoke ring” of darker color around a large patch, with white spots and a darker patch in mornings with heavy mildew. Brown Patch is a lawn disease caused by the Rhizoctonia fungus. It affects turfgrass in late summer, often during times of peak humidity. It is common in areas of high heat and humidity. Unlike some fungal diseases, brown patch does not necessarily kill the grass because it does not affect the root. But it does weaken the grass considerably. 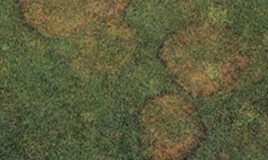 Brown Patch is sometimes the result of over-fertilization. Excessive nitrogen can make lawns more susceptible to brown patch and create an environment that spreads brown patch quickly. Like many lawn diseases, Brown Patch leaves large patches of visibly damaged grass, although rather than the brown color implied by the name, most brown patch tends to be yellowish brown with a dark outer ring that is darker early in the morning. The grass may also have white fungi on the blades of the grass when they are covered in dew. Even though Brown Patch prefers warm environments between 70 and 90 degrees, it is strong enough to survive freezing temperatures. Brown Patch is at its worst, however, when the grass is moist or wet for an extended period of time. Brown Patch starts with prevention. It’s important to first avoid putting fertilizer with too much nitrogen during the time of year when Brown Patch is at its worst (summer and early fall). If you can reduce extended periods of moisture and dew on your lawn, you may also decrease brown patch growth. It’s recommended that you avoid watering at night to prevent nighttime wetness. You should also consider watering your lawn only once a week. If brown patch is too excessive or prevention is important, a fungicide may be necessary. Fungicide prevention is more effective, however, because once brown patch has infected your lawn it may take several treatments to remove successfully.